Visit the salt mines of Maras and the Inca platforms of Moray! 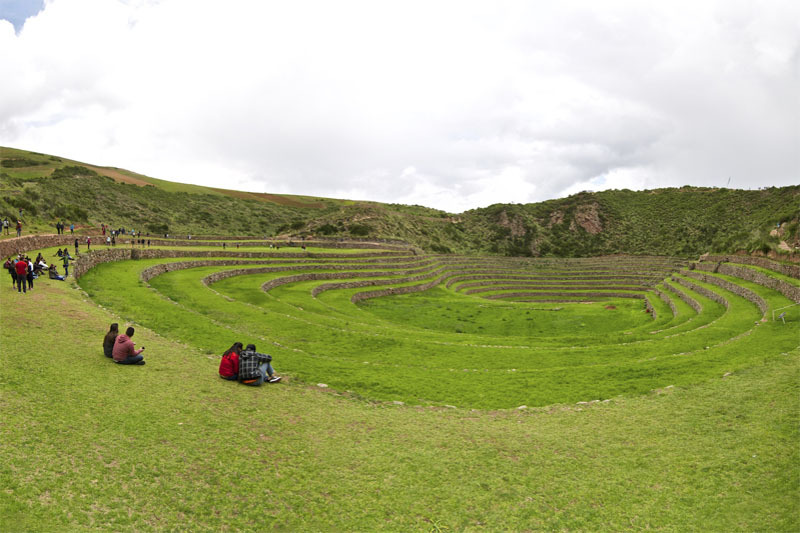 In the small town of Maras you will find the Archaeological Site of Moray, a place with circular terraces that at first sight will seem amphitheaters built in impressive natural depressions. These concentric terraces superimposed on huge holes give the impression of being carved in large bowls. Each of these small terraces has its own microclimate, according to the depth to which it is. Some studies claim that Moray would have been used as a laboratory, to determine the ideal conditions for the cultivation of each species. Many people believe that this construction is one of the most impressive made by the Incas; And undoubtedly touring Moray in the Sacred Valley of the Incas is one of the best excursions prior to visiting the Inca City of Machu Picchu. The archaeological group of Moray is located 7 kilometers from the town of Maras, in the Sacred Valley of the Incas, 38 km from the city of Cusco and 3,500 meters above sea level. You can reach Moray via a detour from the main road between Cusco And Urubamba. Moray is the Quechua word that describes “a territory occupied since ancient times” by the peasant communities of Mullak’as and Misminay.Although the origin of the name of Moray is not known for certain, it is presumed that it had to do with the corn crop called Aymoray, or with the month of May called in the same way, or perhaps with the dehydrated potato known as Moraya. National Geographic describes it as an “extreme example of Inca landscaping”. It is built on a plateau at 3,500 m.s.n.m. And is an agricultural experimental station created at the beginning of the dominion of the Empire of the Incas; Consists of huge circular depressions in terraces, the bottom is about 30 m deep; These huge bowls, might seem a “more natural” version of the stair boxes in India, but their purpose; Studies reveal that these terraces served to concentrate and generate thermal gradients, to affect the local climate. Temperatures vary gradually from 20 ° C in the center (warmer) to 15 ° C in the upper terraces, emulating “in one place”, more than 20 ecological zones with different altitudinal floors that are usually 1,000 m below. On the terraces, vertical stones have been discovered, marking the limits of the shadows at dusk, during solstices and equinoxes. The locals call these rocks “ñustas”. It is said that each one of the terraces of Moray, emulates climatic conditions of different ecological zones, of the different geographical zones of which was the vast empire of the Incas. It is possible that the most precious crop that was developed in this place, outside of coca leaf; The sacred leaf of the Incas. The archaeological complex of Moray welcomes visitors every day of the year, from 7 am to 5 pm. The best way to visit Moray is on a tour organized by the Sacred Valley of the Incas, and before your visit to Machu Picchu. What was the function of the Moray terraces? It is known that at the time of the Tahuantinsuyo Moray produced 60% of the total species of vegetables, more than 3 thousand varieties of potatoes, maize and many other species, besides serving as a center of acclimatization and domestication of species of wild plants that were Adapted for human consumption; But also to grow the coca leaf, which under normal conditions, could not be successfully cultivated in this place. Hundreds of villagers from neighboring communities attend the Moray circular platforms in September and October, in order to celebrate the Moray Raymi or Feast of Moray. The celebrations include folk dances related to the land, production, harvest and agricultural work.